BEEKMANTOWN — Despite posting just one win so far, and even though that record currently includes a three-game losing skid, there’s little doubt that Saranac Lake’s football team is improving. But better play from the Red Storm was still no match for a big, deep Beekmantown opponent. 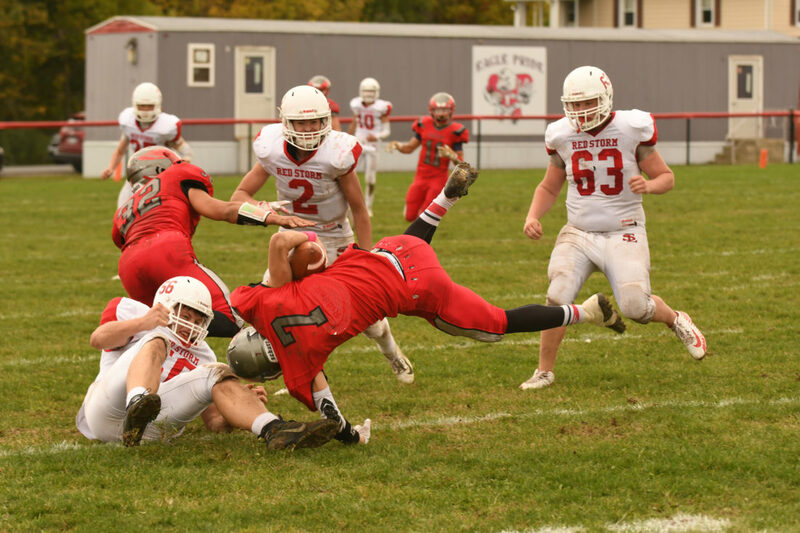 After holding the Eagles to just seven points in the first half, Saranac Lake succumbed to a lack of depth, as well as a relentless running attack in a 27-0 road loss Saturday in Champlain Valley Athletic Conference action. 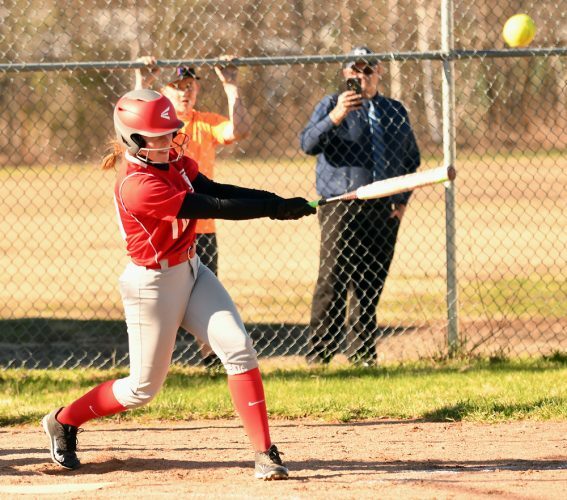 For the third week in a row, Saranac Lake stepped on the field with less than 20 players, and the Red Storm held their own for most of the day against the CVAC’s only unbeaten team. Saranac Lake was in the hunt for a possible upset well into the second half. The turning point came late in the third quarter when Saranac Lake trailed 14-0 and was unable to punch the ball in the end zone from the 3-yard line, which would have turned things back into a one-touchdown game. The Eagles responded with a 94-yard scoring drive after their goal line stand, and added one more touchdown down the stretch to improve to 6-0 and clinch the CVAC regular-season title. In the end, the inability to score coupled with an Eagles ground game led by Christian Moura spelled doom for the Red Storm, who fell to 1-5 with one game remaining in the regular season. 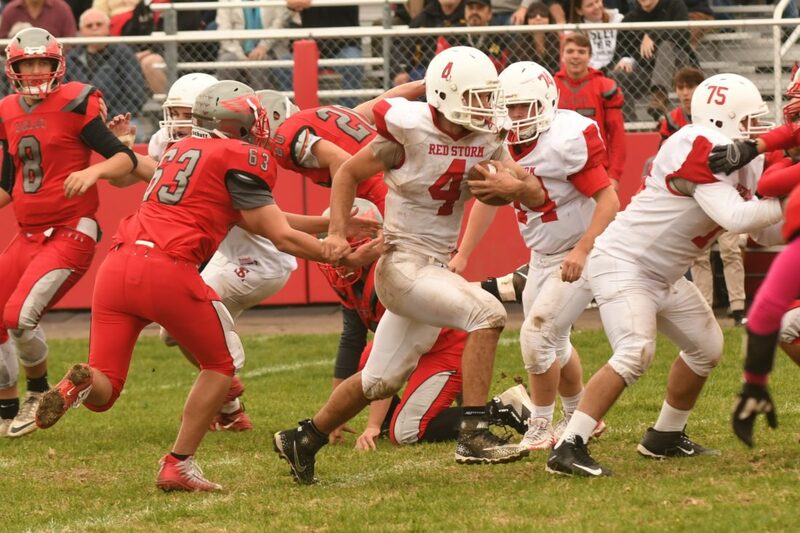 In a run-only assault, Beekmantown piled up 260 rushing yards, with Moura taking on the bulk of the work. The speedy senior finished the day with 206 yards and three touchdowns on 21 carries. Although it looked like another lopsided loss on the scoreboard, the Red Storm may have turned in their best performance to date, especially early on. On defense, Saranac Lake forced the Eagles to go three-and-out on the host’s first two possessions, and then came through with an interception the third time Beekmantown had the ball when Dylan Stewart picked off a tipped pass. The lone score of the first half came on a 22-yard Moura touchdown run 3:10 into the second quarter to cap off a 77-yard march that took just four plays, which were all runs by Moura. The Eagles started the drive at their own-23 after the Red Storm offense was unable to pick up two yards on a fourth-down play and turned the ball over. The Eagles took advantage of great field position for their next score, which came on the opening possession of the second half. Beekmantown started with the ball in Saranac Lake territory after an attempted squib kick landed right in the hands of Eagles’ running back Conner McGinnis, who returned the ball to the Red Storm’s 41-yard line. Six plays later Beekmantown was in the end zone on Moura’s 5-yard touchdown run, and Alex Trudeau followed with a successful conversion kick for a 14-0 Eagles edge. Saranac Lake then answered with its biggest threat of the game on a drive that started at its own 39. Sticking to the ground, and with the help of a personal foul penalty against the Eagles, the Red Storm offense advanced deep into Beekmantown territory and were looking at a first-and-goal from the 7. Junior tailback Ben Munn then banged ahead to the 3-yard line, but that’s as far as the march went. Saranac Lake was stopped for no gain on the next two plays, and on fourth-down, Beekmantown defenders dropped Red Storm backup quarterback Dylan Stewart for a 3-yard loss. With the ball back in their hands at their own 6, the Eagles marched the length of the field to put the game out of reach, with Moura capping off a 7-play drive on a 1-yard touchdown run. Trudeau tacked on another point with his third successful conversion kick for a 21-0 Beekmantown lead with 1:49 gone in the fourth quarter. William Colvard scored the game’s final points on a 1-yard touchdown run with 4:42 left on the clock. Beekmantown headed into the matchup with more than twice as many players than Saranac Lake had dressed for the game. Eagles head coach Jamie Lozier was present for the first half of the game, left at halftime to attend a family wedding, and returned just in time to address his players after their title-clinching victory. In Lozier’s absence, assistant Jeff Jolicoeur took over the head coaching duties and said the Eagles realized they were going to be in for a battle. 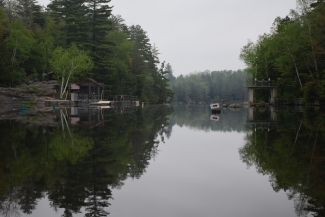 “All week long we preached to the guys that Saranac Lake wasn’t going to just come in an say ‘Oh Beekmantown, they’re 5-0,'” Jolicoeur said. “We knew they’d come ready to play. That’s a program with a lot of history to it, they’ve been really successful. We struggled in the first half, there’s no doubt about it, because they made us work. Luckily when we needed to buckle down the defense came up big. Saranac Lake only turned the ball over once on an interception late in the first half that had no bearing on the score. The Red Storm offense finished with 161 rushing yards and another 49 yards through the air. Munn again led Saranac Lake in yards gained, picking up 56 yards on the ground in 15 attempts. Saranac Lake quarterback Rhett Darrah ran the ball 20 times and finished with 32 yards. Those numbers would have been more positive, but the sophomore was dropped for losses on six plays for a minus 37 yards. Darrah completed 6-of-10 pass attempts for 42 yards and no interceptions. Junior Isaiah Buckley also churned out 37 yards on four plays running in a backup role for the Red Storm late in the game. Munn, as well as Bennett, both said Saranac Lake’s junior-laden squad has come a long way, since the start of the season. “Beekmantown thought they could look past us and we showed them how we can play,” Munn said. ” We don’t sit down, we don’t give up until the end, and they figured out we are a lot better than our record today. I thought in the first half and into the third quarter we did a great job shutting down their offense, and our offense was moving the ball, we just couldn’t get it in. We were at the 3, and that hurt. 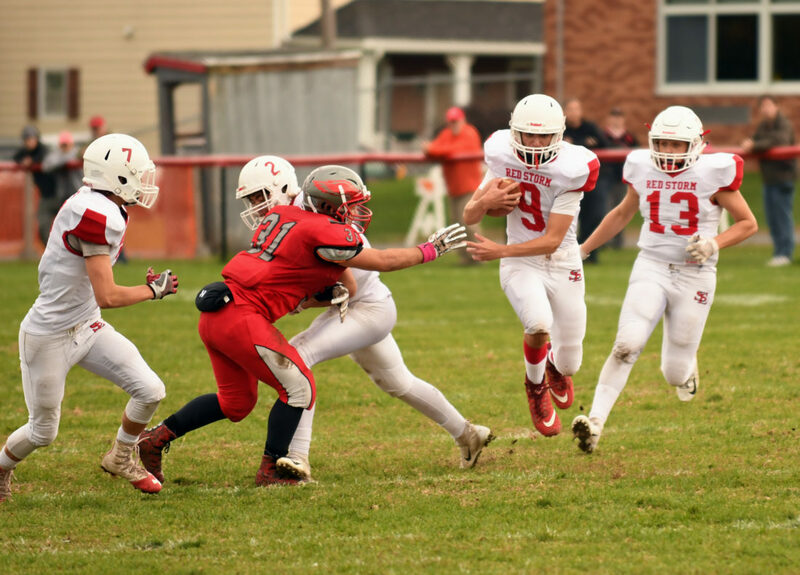 Although Bennett thought his team could have done a better job slowing Beekmantown’s runners, and there were a handful of Red Storm mistakes that stood out, he said he couldn’t have been happier with his team’s effort. “I’m really proud of our kids,” Bennett said. “The theme is Ironman. We’re rolling with 18 today dressed. Just like they’ve done all season. they played hard, they played intense, they played with real commitment to discipline, technique and scheme. It was great to see our offense moving the ball and presenting problems for Beekmantown’s defense. Beekmantown will look to wrap up an unbeaten regular season when it hosts Moriah on Saturday. Saranac Lake will also be at home Saturday for its final CVAC matchup when it hosts 3-3 Peru starting at 1:30 p.m.
SL — Munn 15-56, Darrah 20-32, Shipman 2-21, Stewart 3-6, Buckley 4-37, Brown 1-9. Totals: 45-161. B — B. Belrose 5-28, Moura 21-206 3TDs, McGinnis 3-17, Colvard 5-30 TD. Totals: 34-281 4TDs. SL — Darrah 6-10-0-42, Stewart 1-3-1-7. B — B. Belrose 0-4-1-0. SL — Shipman 5-38, Stewart 1-4, Hough 1-7.